Deliver better services, reduce expenses and comply with regulations are familiar business demands heard by financial services IT leaders. Simultaneously, the time and cost of managing custom apps to run core business operations continues to rise. Not only does this obstruct the speed of adopting innovation, it also increases the need for better end user experiences due to app management volume. How can financial services IT teams enable more efficacy alongside business growth, while reducing their own IT management burden? 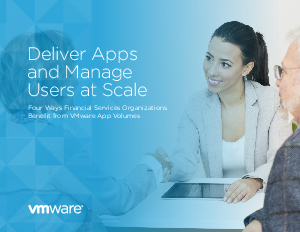 This ebook examines four ways financial services organizations can deliver apps and manage users at scale while reducing costs and optimizing existing investments.